Did you know that salt has played a major role in human history, and its availability has frequently effected the type of governments we have? Humans need salt to live - it is a dietary necessity, so whoever has control of its production and/or availability, controls other people. This book discusses that and contains everything and anything you ever wanted to know about salt. It is a fascinating book, both for those interested in food, and history buffs. Yes, Kurlansky is worth his salt as a writer, researcher and uncoverer of unknown facts about odd subjects. As he did with his previous non fiction books he has woven strands of information into an interesting tapestry, equal parts - enthralling history lesson and cultural voyage. The only problem is at 450 pages and 26 chapters, with numerous visits to different cultures, countries, eras and rulers in an attempt to cover as many of the 14,000 uses that salt is known for - finishing SALT: A WORLD HISTORY leaves you in a brine of facts, but also very thirsty for a unifying theme or story and a more memorable read. Certainly my knowledge of historical trivia is now seasoned with tidbits such as: the Anglo-Saxon word for saltworks being 'wich' means that places such as Norwich, Greenwich, etc, in England were once ancient salt mines; Ghandi's independence movement in India began with his defying the British salt laws, and the French levied taxes on salt until as recently as 1946. A common theme in Kurlansky's books is that food is seen as a topic of historical interest. Here we learn about the role salt played in preserving cod, whale, ham, herring, caviar, pastrami, salami and sausage, and as it was with COD and THE BASQUE HISTORY OF THE WORLD this book is sprinkled throughout with recipes. Salt is certainly an interesting subject; cultural history buffs will love this book and Kurlansky still has a humorous, easy, and very readable writing style; it's just that he probably could have salted away some of the facts without us missing much and he should have developed a flowing theme rather than one that was so saltatory. Cook pasta according to package directions. In skillet, heat olive oil over medium heat. Add smoked sausage, onions and green bell peppers. Stir. Cook until onions and bell peppers are tender. Add diced tomatoes, tomato sauce, salt, pepper, garlic, basil and oregano. Stir well. Once pasta cooked, drain well. Add pasta to meat mixture, stir well. Just before serving garnish with cheese. Enjoy! Several years ago I went to see Tony and Tina's wedding in Chicago (a ridiculously fun, interactive theatrical show) and they served a dish like this one at the "reception". It was so yummy, and every once in a while I think about it, but I've never made it and a sufficient amount of time has passed that I might not have been able to remember what exactly was in it to make it taste so good. I think you've got the perfect recipe :-) Thanks again, Christine! MMM, sausage and pasta sounds delicious! And it looks really beautiful too :) I love salt so it's a good thing it's a necessity for our body! Great and interesting facts on the history of salt, one of my favorite condiments. Thanks for sharing! I love the combination of sausage and pasta. This looks very delicious. Sounds very tasty and an interesting story re salt and the history behind it and how it is so necessary for survival and whoever has it has power! I love sausage with pasta, and interesting "wich" trivia! Thank you for all your comments. Have a great weekend. 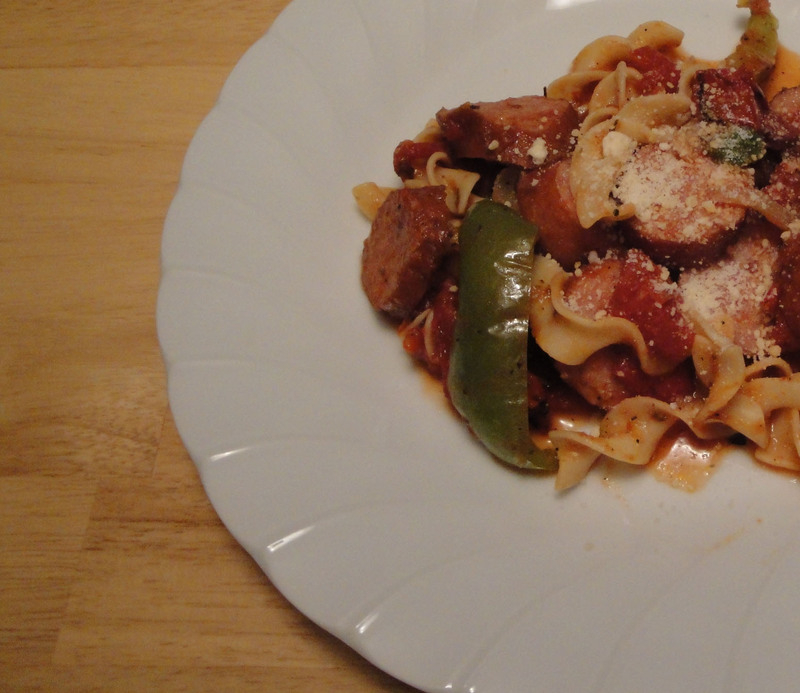 Great dish..We love sausage and pasta!! Thanks for posting.. I'd eat this one! I love tomato sauce, well actually I love tomato paste and will eat it out of the can. Adding peppers only ups my craving. Yummy dish Christine. Have you ever read the book Salt? I forget who wrote it but very interesting. Looks great Christine! I always put sausage in with my sketti sauces 9as well as ground beef and whatever other meats I can manage to shove in there hehe) cause it adds sooooo much flavor! I haven't read the book Salt. Sounds like interesting book to read. Yum! Sausage and pasta - such a great and easy dinner! I have not had pasta in like 2 weeks which is way too long for me! I'll have to make this for sure! I like all your riffs on the word salt...especially saltatory. Fancy salts and specific salts are so in now and I admit I like the trend. What do you think that reflects about our current culture? My father-in-law read that book too--thanks for the summary! Salt is the oldest "spice". It goes in cycle like everything else. I hate to admit I love salt. But it's true. I love this recipe. It looks scrumptious. Well done again Christine, I really like the education I get from your posts. Rgds, A. One of my favorite food combos.